Sorry, this entry is only available in Asv Angļu, Eiropas Spāņu, Katalāņu, Vācu, Franču, Poļu, Krievu and Turku. For the sake of viewer convenience, the content is shown below in this site default language. You may click one of the links to switch the site language to another available language. Because we all have different visions of life and diverse personalities, Ecotopia Biketour has developed a set of basic values, which helps all of us to create similar expectations from this project. Proposing different ideas and sharing diverse insights is always appreciated, but please keep in mind that these are the basic values of the Biketour. Biketour is a non-hierarchical community, and there is a collective responsibility to realize this principle. Decisions are made and problems are resolved by practicing consensus. 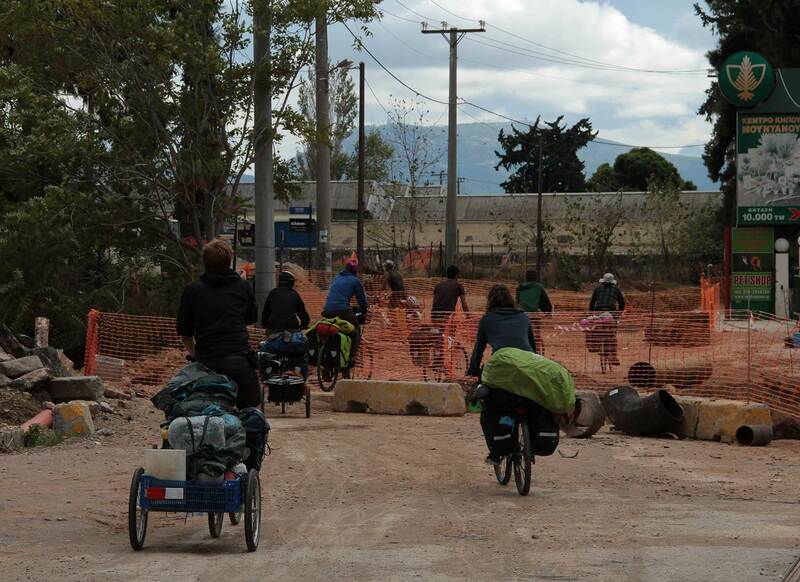 Many people who come on the Biketour are not experienced with working this way, so please bear in mind that it works best if people concentrate on the discussion and make constructive proposals for concrete problems. We try to keep a balance between working effectively as a group and respecting everyone’s personal preferences and freedom. Ecotopia Biketour is self-organised. It is prepared by an open group of former participants and anybody who wants to help out. On the tour, there is ideally no difference between organisers and participants. The people who prepared it try to share their knowledge with other participants so that all of us know how to keep the Biketour going. Everyone is welcome to help out with organising the Biketour. Get involved! On the tour, all tasks are shared on a voluntary basis. 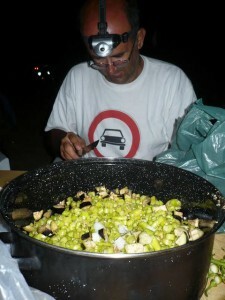 Everyone can choose when/if they want to pull a trailer, keep the communal money, or do the cooking. 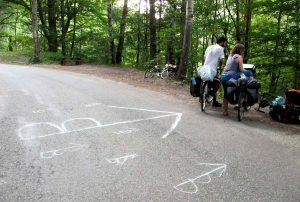 The Ecotopia Biketour is multi-lingual. It is a collective responsibility to make sure everyone understands and can be understood and, if possible, alternating the language used in circles (regular meetings). In the past, English has most of the time been the dominant language on the Biketour, but we encourage multilingual communication so as to include those who do not feel comfortable communicating in English. On the Biketour we aim to create a non-discriminatory environment, where discrimination based on perceived or actual gender or sexual orientation, class, race, ability or religion is not tolerated. The Biketour, like anywhere else, is not a place free of discrimination, but it should be a place where discrimination is discussed and challenged in an open and constructive way. We encourage people to be willing to listen and learn. 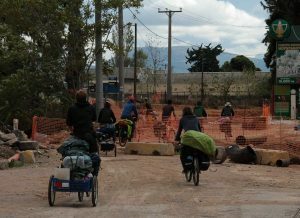 Although everyone can join Ecotopia Biketour, it is not open to people who show persistent oppressive behaviour. The Biketour commits to supporting and promoting the safety of participants from all kinds of oppression and discrimination. Privacy must be respected: towards other participants and the projects and groups that we visit. Photography and filming should be cleared with all participants before hand, and no photos or videos should be uploaded, sent or published on the internet without the explicit consent of all the people depicted. Because the group often is very diverse, participants should be considerate of their different experiences and backgrounds, and varying involvement in activism, which influence their values. We are all working towards finding what values work best for the Biketour community and society at large. People have extremely complex personalities, so even if someone disagrees with something that is important for you, you can still find something great and inspiring within this person. The Biketour aims to provide opportunities for non-formal education. Here as well, everyone is encouraged to take an active role in making this aspect of the Biketour a success. If you think that you could give “workshops” on a specific topic or share an ability, you are more than welcome to do so. Everybody should be able to participate in the Biketour. Therefore, in the “Ecotopia style” of touring, the distances are kept low and we try to make it possible for everyone to go at their own pace (for example by having some people leave early to mark the way) We support each other with preparing and fixing our bikes. We firmly oppose the current economic system in favour of alternatives that fit our values. We want to make participation inclusive – also in regard to money. For this reason, our money is collected as an anonymous, suggested donation of 3–5 EUR per day (or equivalent in other currencies) This donation is voluntary and people who can give less or nothing at all are also welcome to join the tour. 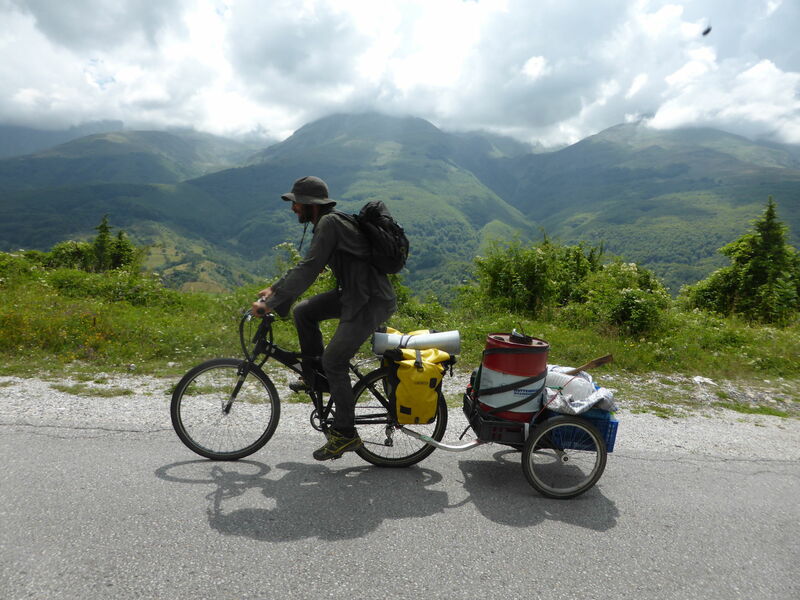 The average amount of daily/weekly biketour costs are hard to estimate, because currencies fluctuate, economic circumstances change every year and we cross regions with very different cost and income levels. If the suggestion for the donation had to be corrected, this would happen through a consensus decision with participants during the tour. Economic inequality also has a big influence on people’s ability to travel to, from and with the Biketour. This is why we consider different mechanisms of refunding travel costs when possible. 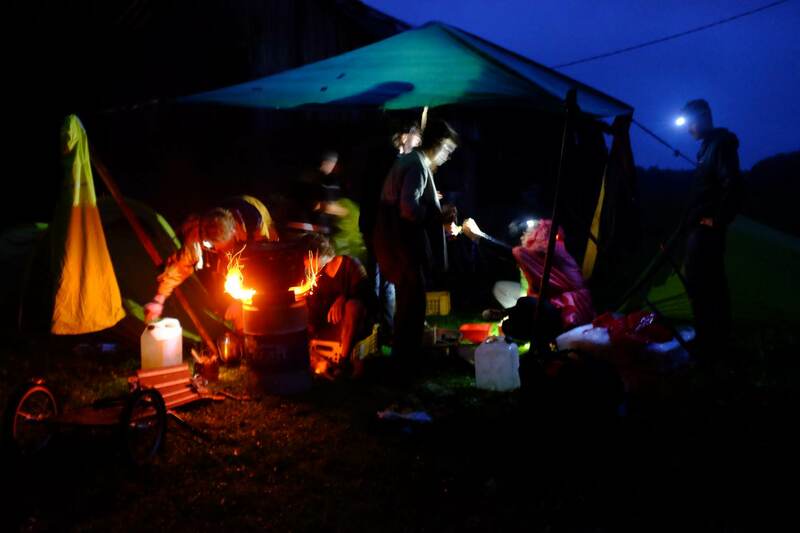 Ecotopia Biketour is a not-for-profit, DIY activist community run by volunteers. All the money that we collect is used to cover the costs during the tour and next years preparations. Ecotopia Biketour is a project which promotes sustainability by actually practising it. We travel on bicycles, as they are one of the most low-impact ways of transport. We actively promote our way of life by updating our blog, making presentations, distributing leaflets, doing interviews for local media and try to be inspiring for the people that we meet. We participate in actions organised by local groups and are always keen to plan and implement various actions ourselves. All common food on the Biketour is vegan, which is suitable for most of the participants and also expresses our environmental and ethical consciousness in regard to food consumption. Meat eaters and other non-vegans are welcome to join the tour, but we won’t buy non-vegan things from the communal money. 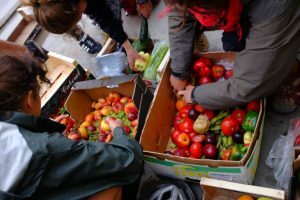 If we can’t find enough food in the bins or in the wild, we choose to support local farmers/small shops because industrial farming and supermarket chains produce many social and environmental problems. Please buy food in small shops or directly from local farmers! Small is beautiful. We try to use self-hosted Free and Open-Source Software to attempt to not let big corporations and governments use our data for profit, surveillance and repression. We encourage you to avoid planes for joining the Biketour. Although they have the worst impact on the environment amongst the different means of transport, planes become more and more popular. 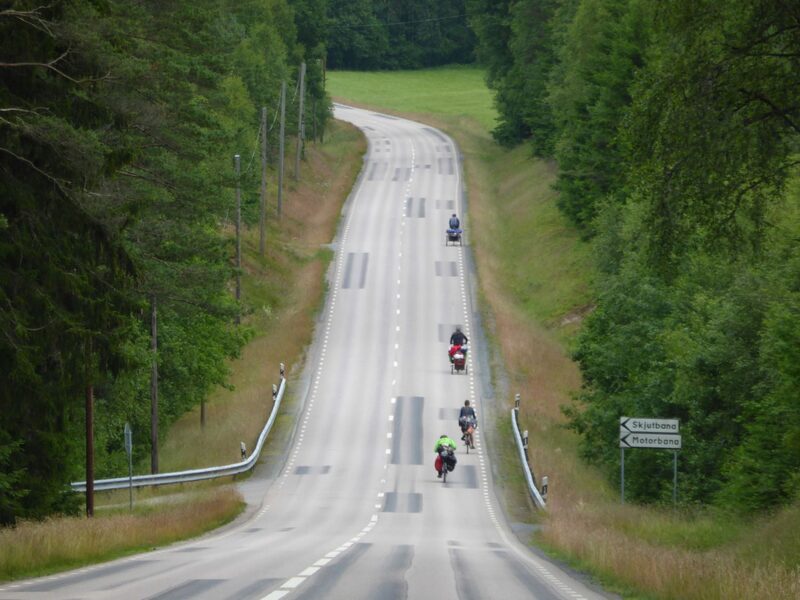 We try to provide information about alternative means of transport to and from the tour. Anyways, you are still welcome to cycle with us, if you have to fly! In bigger groups, people need time to get to know each other and joining participants need time to adjust to the group and learn about the self-organisation processes that we share among us. Therefore it would be nice if you stay with us for a minimum of 1-2 weeks to become an active member of the group, although shorter stays are also welcome. These guidelines have evolved from 27 years of experience, and the thousands of participants that have taken part over those years … we are always open for new ideas and suggestions to improve this process – to make the Biketour experience an example of the social and political and well as social values we all share.